On the other hand, my husband is a professional swimmer. He represented Malaysia in SEA Games when he was 10 years old in swimming. 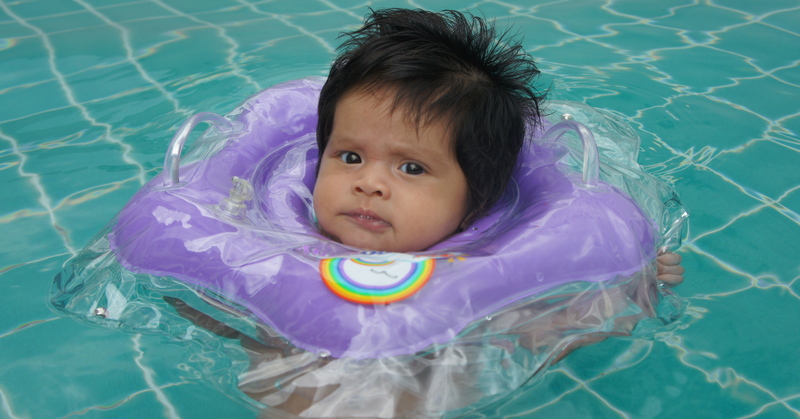 Taddaaaa… Hahhaha..
We have decided to teach Bella to swim at very early age.. Sometimes I think we are very kiasu parents 😉 So, we bought this book titled How To Teach Your Baby To Swim.. Keyword here is BABY!! Yes, not need to wait until 5 or 7 or whatever age.. baby can swim!! We have started familiarize Bella with water at very early age. If I’m not mistaken, it was when she was about 2 weeks old, right after her umbilical cord detached 😀 ~super kiasu!! That’s Bella again at less than 1 month old.. She definitely loves water..
Once she’s ok with water. we put her in this floating device for baby which surrounds her neck nicely and let her float in the pool 🙂 Nope, don’t worry, she wasn’t alone in the pool. Daddy was in there too.. In this position, she will learn how to use her legs and hands.. This was at 2 month old..
We also did this in the bathtub.. while allowing her to float, we slowly introduced water from the shower tap. This is to train her to close her eyes and hold her breathe under the shower tap. Up until now, Bella loves to chill by the poolside..
No she doesn’t know how to swim yet. At this point of time, she is comfortable being in the water. She is still learning how to use her hands and legs to swim. We would love to bring her to the pool more often but unfortunately work (and bad weather!!) always interfere.. Haih… Biler nak pandai nih?? P/S: Please please please don’t simply do like what I wrote here unless you have read the book “How To Teach Your Baby To Swim” or you know signs of aspiration or CPR!! Posted on February 7, 2012 by Dr Halina Mohd YunosPosted in MommyhoodTagged swimming. Previous Previous post: Mommy’s Back To Work!! Next Next post: How To Survive a Long Haul Flight with Your Baby? suka tgk first pic.. so khusyuk listening her dad. ceh gambar terakhir bella tu dah mcm mommy dia style amik gambarnya! haha..
wahhh..patutnye daddy kene ajar mommy bella swimming dulu,barulah ajar bella…hehe..sekarang ni daddy kene ajar dua2 sekali lah..tak pon gilir-gilir,bella naik,mommy turun dalam air,mommy naik,bella turun..daddy sampai akhir dalam air..
(*_*) suke…dan suke…dan terus suke writing this time doc…. thanks innanie.. thats very kind of you 🙂 i guees we, women always try to give the best for our children. all the best!! care to share kat mana u hantar ur kid swimming class tu? i dah lama cari swimming class for toddlers. Yes its by glenn Doman!! Dya teach your child the reading and math too?? How old is your son now? I got my book from either MpH or kinokuniya.. Tak ingat..
i dont how to swim too and im scared to put my Hana in the water even with floating devices..hehehe..but will definitely try to teach her when ‘mama’ is ready..hehehehe..
hi dr halina. love ur blog. u know what. me and my husband pun at the moment tgk sibuk nak teach our baby swimming. like u i cant swim too. ive always been terrified of the water since dis incident when i was 12. i almost drowned in the SEA! long story but yeah. since then mmg nampak pool or lake takut sgt2. so i dun want my baby to be like me. been checking out baby swimming videos kt youtube. there’s so many. in the US they have lots of survival swimming lessons for babies. i xtaulah if kat KL ada, but yg i tau classes kt sini start when they’re at least 2 yrs old. itu yg i tau. we’ve been training our baby ‘DIY’ style based on those videos matsalleh. every weekend bwk our baby p swimming pool at our house alhamdulillah he’s managing pretty good… dah pandai float (with daddy supporting his head) and insyaAllah when dh ready we’re gonna try letting him float sendiri. practice makes perfect, no? hehe. good luck baby bella! kids nowadays shud start swimming lessons early kan? interesting doc…caiyok bella…follow daddy’s footsteps! (Riwayat Bukhari dan Muslim) So, you’re on the right track in teaching Bella to swim. Teach ’em young, doc coz bila dah adult like us.. it’s more fear than fun.. hehehe..
wah, sangat mengujakan.. mata Bella sangat bersinar bila berada dalam air..
macammana nak ajar Dr kalau saya pun tak pandai berenang.. hihi.. I x ada anak lagi but my mom told me that when she was in the US, most of her friends yang ada anak start biarkan their children in the pool since they were about 2 months old because babies have the ability to swim by themselves especially when their faces are submerged in water, it’s called swimming reflex or something. But the reflex only up until 6 months la. like rooting reflex. i did that as well .. tapi hasilnya belum terserlah(belum boleh swim W/o pelampung macam anak zahnita model).. ada la bila time2 dia berani dia akan kayuh kaki n tangan dia dalam pool tu .. i mula masukkan dia dalam air since she was 4 months old.. n now da 10 months.. apa yg i buat adalah.. masuk sama2 dalam pool then tunjukkan gerakan apa yang i nak dia buat.. such as kocak air .. i kocakkan i dulu biar dia ikut.. bila dia ikut i..then go to another step gerakkan kaki.. bila da lama2 buat biarkan dia floating di bantu oleh pelambung leher tu.. dia akan gerak sendiri.. dan ransang dia agar dia happy..
Once my nephews completed their early vaccinations we brought them to the pool. Each learned at their own pace but we just let them go in the water, ready to support them out if needed, but almost all the time we let go, they float up on their own and they dog-paddle … when they were a little older and became more aware of the water, that was when they were a little more cautious. But by then, they could do the basic. 1. saya cuba avoid baby utk fobia air. jangan tarik dia dalam kolam lau dia tak redi. biar dia turun sendrik. 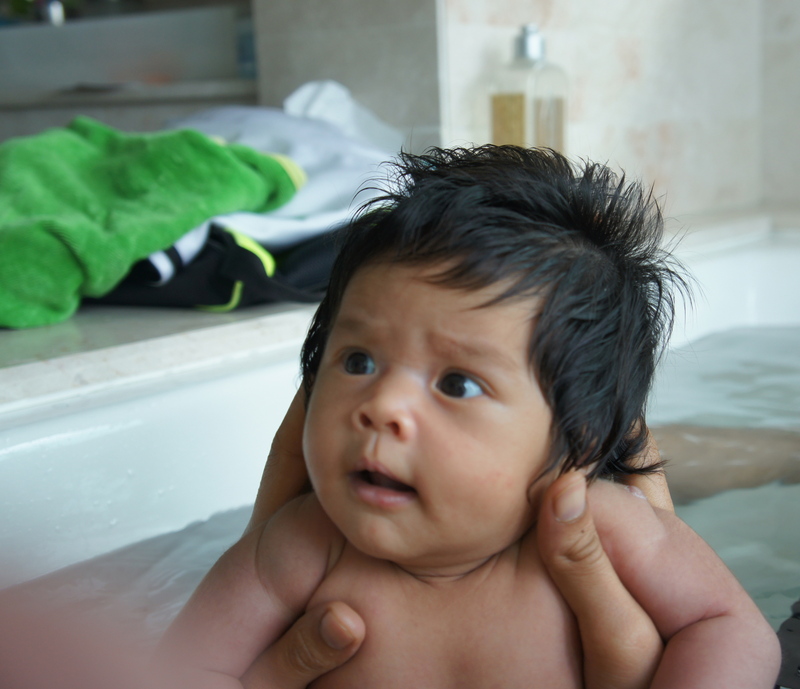 2. saya bawak baby mandi kat pool adult. 3. lau pool ramai orang, try jauhkan dari tempat orang ramai @ air yang berkocak kuat. sekarang ni anak saya (baby di atas) dah 4 tahun. boleh berenang tapi teknik tak betut. jadik, saya dah sign up dia untuk join swimming class yang di ajar oleh cikgu yang ajar saya jugak http://jomrenang.com/2011/09/kelas-renang-dibuka-untuk-pendaftaran/ memang tunggu umur dia layak utk join the class. So, apa yang Dr buat tu, mmg sama apa yang I belajar masa dalam kelas dulu. Mula-mula baby kene biasakan diri dengan air. lepas tu, baru ajar baby how to float. when baby starts to crawl at the age of 7months, secara automatic dia akan kayuh kaki tangan dia dalam air. Doc, Bella tak kembung perut ke lepas ‘swim’? Alhamdullilah she never had any kembung perut issue..
dr…just wanna ask, air tak masuk telinge baby ker doc? bile tgk gmaba2 bella tue…just trus tefikir yang tue… xmerbahaya ker if air msk telinge baby? Shud be ok.. Wipe off with towel after that..
DR…. where to get floating device like Bella used and what we call it? 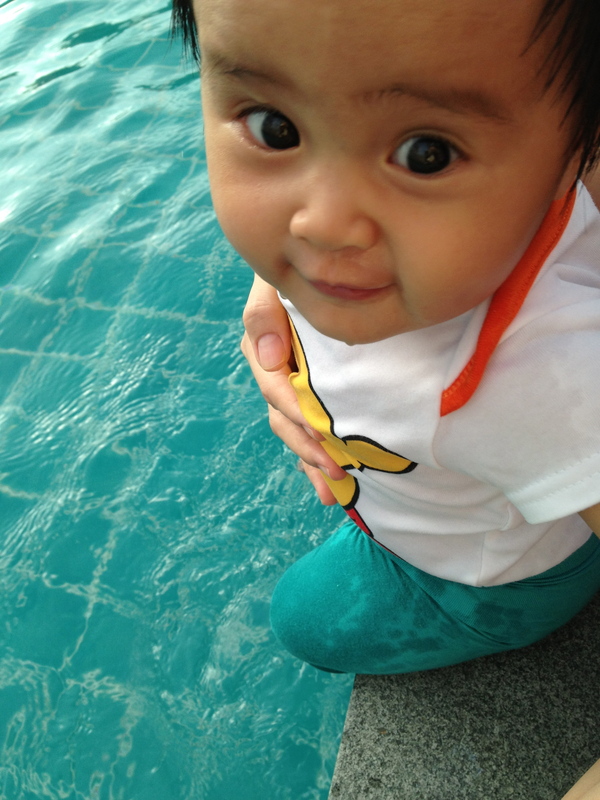 I want my baby swimming too, xnk jadi cam her mom xtau swim…heheh….thanks…. I got it from toy’r’us..
less than 1 month dh boleh ajar baby swimming ya? Better use air suam or air paid biasa je? since 2 of you love to train kids and kiasu, i suggest you can plan for second child already.